In November 2007, Christopher McElroen partnered with renowned visual artist Paul Chan and New York public arts organization Creative Time to reach out into the New Orleans community to stage free site specific performances of Samuel Beckett's Waiting for Godot in the Katrina-devastated neighborhoods of Gentilly and Lower Ninth Ward. This experience has been the most exciting of my life. This was the best of New Orleans, the humanity of New Orleans, all kinds of people coming together as one: Ninth Ward residents, people who may never have been to the Ninth Ward and everyone in between. New Orleans was one, unified in spirit. And I haven’t seen or felt that in a long, long time. For me, there were times when it wasn’t a play, when it was so beyond the play… And theater did this! That’s what art is all about. Art is to the individual what thoughts are to the community. Friday morning at 7 a.m., my 14-year-old son, wife and mother will start the roughly 560-mile drive from Nashville, Tenn., to...see a corner lot staging of “Waiting for Godot”…I want [my son] to see how a neutral ground stage can become a place of social and political comment and a play can be a call to action. I want my son to see theater that touches lives and does more than just entertain. So, we're driving nine hours, lawn chairs in the trunk, to see art. 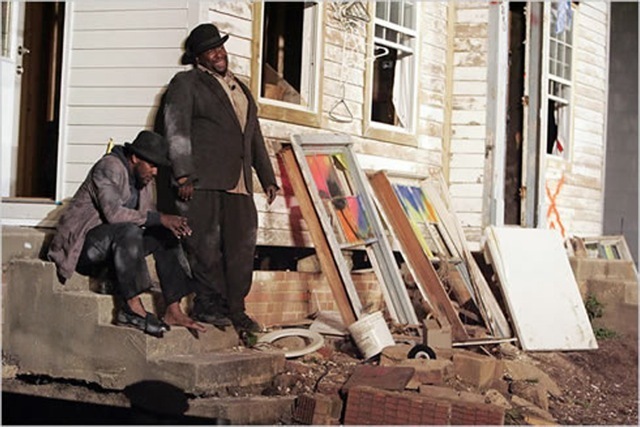 Still Waiting on Repairs, New Orleans Hosts "Godot'"
A Broken City. A Tree. Evening. Complete production information and photos. Op-Ed about the crowd while they waited, reactions to the show. From conception to local interaction. Focus on New Orleans and actor Wendell Pierce. Account of the Lower 9th event, with critical review of CT, CTH and Chan. Process, community interaction and workshops. Anne Pasternak on public art. Critical essay on “Godot”, short review of performance. Paul Chan speaks at Harvard. Pulling quotes from various articles- critiques the impact. Description of event attended by audience member. Description of project from press materials. Writer deeply moved by setting Godot in the setting.